Well, this part is straightforward, analyzing what's on the document, seeing what it could possibly mean. Do note, large parts of it are estimations and thereby not facts! This is merely to see what the document is about and what it possibly links towards. The leaked document was found by N'maro Makari in a public data channel. The intelligence agency of the Minmatar Republic, safeguarding their Freedom through covert operations. They are controversial however for having strong ties with underworld elements. Well, self explanatory, it's only meant for approved personnel, which obviously doesn't include us. If by chance you are authorized to read this, you can contact Aurora News to share some deeper insights about this document! Possibly the document ID, or a reference to an ID of an archived document. The 111 might point to YC 111, as it appears later as well. One of my contacts informed me that the number 30003471 is the ID number of the system Konora. Might refer to which division within the RSS the document was meant for or is relevant for. Can also be the division that assigned the tasks laid out within the document. DED is short for Directive Enforcement Department, the CONCORD Police enforcement division, specialized in tracking down & arresting criminals & taking down criminal organisations. The number might relate to a specific DED file or operation. An important bit of detail, telling us this document is probably related to something that occurred around this date, either a summary of an occurrence, or a plan of action for a future task, or a report for a variety of reasons. To keep things simple, I picked events around this date that relate to the Minmatar Republic, as it's a document from the Republic Security service. I like to stress that these are merely theories & calculated guesses and not facts! The list goes from most likely to least likely, as by the personal opinion of the writer after analysis of the found data. This is the most likely event to which the documents refer to, as it contains a variety of elements that would gain the interest of the RSS and it's inclusion in a classified report. Also the number 30003471 is the number ID of the system Konora! The short gist is this: Officials in the Konora system co-operated with a renegade Angel group in orchestrating food shortages, giving way to extreme profits with food on the black market. Any protests were repressed violently. Once Republic & Thukker forces found out about this, a military action was set up to drive out the renegade Angels and return law & order to the Konora system. Through the use of existing Wormholes, the Thukker fleet was able to launch a surprise attack, giving the Angel fleet no chance to react timely. The few renegade Angel ships that managed to escape the assault were destroyed by Angel Cartel ships who were waiting at the escape routes into deep space. As reason they stated that these renegade Angels 'broke the Cartel Code'. Their presence was seen as more than mere coincidence, giving way to the rumour that they had been informed prior of this operation. These 5 articles paint the full image of the Konara incident, involving a rogue Angel splinter group & corrupt Republic officials! Abel Jarek was a former slave who preached the Amarr Faith in the Republic. As leading member of the Salvation Crusade, he used the influence he gained through his followers to establish several controversial townships. This eventually lead to the attack on a township where he was killed. Considering Abel Jarek's profile & the controversy that he spread through his preaching of the Amarr faith, it's very likely that the RSS had a file on him. A followup on the above report can be found here: Minmatar Converts Deeply Concerned by Jarek Killing, Political Rights Demanded, where the Minmatar following the Amarr faith express their concerns about the investigations into Abel Jarek's death. As can be read in Sanmatar Shakor Delays Tribal Assembly, Returned Tribes 'Need More Time', the death of this Minmatar preacher caused enough ruckus to delay the Tribal Assembly, an act that would surely catch the eye of the RSS. While unlikely, it might be that an archeological dig or any other form of excavation found something on the planet Pator III, also known as Huggar around the time mentioned on the document cover. Pator III holds a big significance to the Minmatar, as this was the first planet to be colonized by the Minmatar during their first era of space-exploration. After the Day of Darkness, it was a frequent stop for the Amarr Slave raids. What does make the planet more interesting however is that there have been found possible signs of an even earlier colonisation attempt, one that would predate the Minmatar by millenia... Any such evidence would surely end up in RSS archives should it be excavated, as most ancient races who could have done this, also possessed advanced technology. While not directly related to the Republic, this would be a disturbing development for the Republic nonetheless. The Cranial Controller is a brain-implant that can be used to control the workforce, an option that is attractive for Holders who like to keep their slaves in check without Vitoc. An earlier publication ties in to this: Theology Council declines to hear Transcranial Microcontroller debate, where the Theology Council declares that the method to control slaves is up to the Holder to choose. It's unlikely however that the document refers to this, as there are multiple corporations already offering similar devices & this announcement just happened to occur around that date. These are the 4 events & locations the uncovered classified RSS document might relate towards. Hopefully, investigators will be able to confirm or deny certain events, narrowing down what the document might be about! 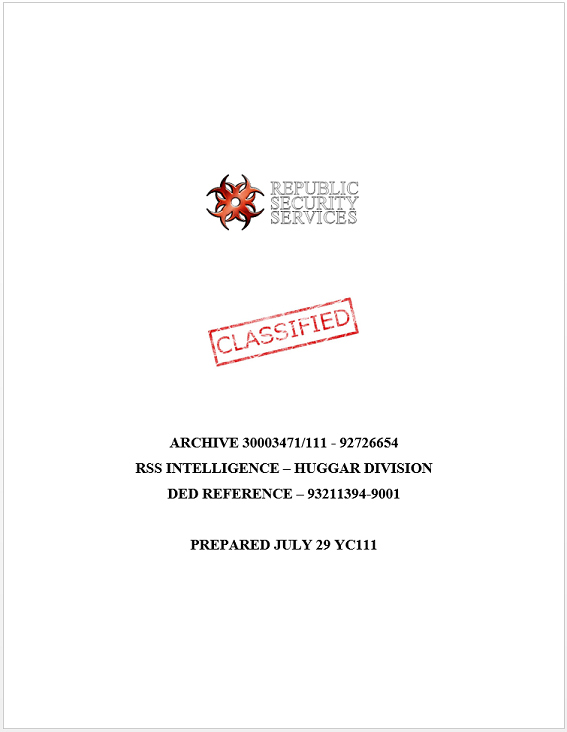 You can discuss the leaked document here: Possible Leak From Republic Security Services? created by N'maro Makari. This is a thread where capsuleers share their insights & arguments on this classified file! Add your own thoughts to it!